A costume designed by Chris Impink for the first Katsucon maid cafe. 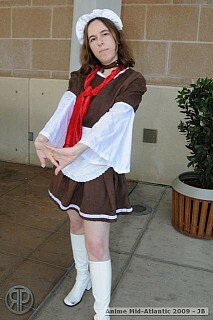 The dress is brown faux-suede with velvet ribbon trim, and the sleeves, apron, and katyusha are white taffeta. The dress trim, katyusha, and lace on the apron were all hand-sewn.